In large bowl, beat butter and confectioners’ sugar with electric mixer until light and fluffy. Stir in peppermint extract followed by salt and cocoa powder; mix. Add flour and mix to incorporate. Divide dough in two pieces and roll into logs. Wrap and refrigerate until firm, about 45 minutes. Preheat oven to 350 degrees. Slice logs into 1/4″ cookies and place on parchment-lined baking sheets. Bake 5 to 6 minutes. Remove cookies from oven; cool on pan 3 to 4 minutes. Remove to wire rack to cool completely. Place chocolate in large microwave-safe dish. Microwave 30 seconds on high, stir and continue to microwave in 10- to 20-second intervals, stirring after each until chocolate is melted and smooth. Stir in peppermint extract. 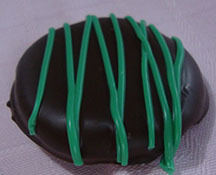 To frost cookies, place one cookie on slotted spatula, carefully dip into the chocolate, coating completely; lift cookie out. Hold cookie on spatula, allowing excess chocolate to drip off. Place cookie onto wire cooling rack to let chocolate set. Repeat with remaining cookies. Place coated cookies in freezer for 1 hour to set before storing or serving. Store cookies in airtight container for up to 1 week, or in freezer for up to 3 weeks. Great holiday ideas and recipes Jane. You are truly talented. I love to copy the family recipes. Especially from Dad, he has most of grandma Bitting’s. Have a great holiday & hope to see you both soon.